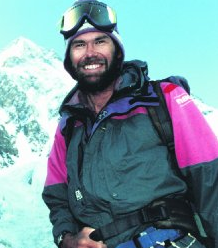 There’s an excellent movie showing in cinemas at the moment that tells the story of an ill-fated 1996 Everest expedition that resulted in the death of expedition leader New Zealander Rob Hall as well as another guide and two climbers who had paid up to US$65,000 each for the chance to make an attempt on the summit. Everest features breathtaking cinematography (try to see it on the big screen) and a star-studded cast including Emily Watson, Keira Knightley, Josh Brolin, Jake Gyllenhaal and Robin Wright. What I particularly liked about the storytelling was that it didn’t shy away from recounting the key decisions and turning points that led to the disaster. A lot of the movie features the main players clinging to the side of Everest or sitting in wind-swept tents at base camp arguing over the practicalities of mountain-climbing in a particularly extreme environment. Everest succeeds in making all of this gripping viewing and knowing how things ultimately played out, our sense of unease only deepens as the bad calls mount up. For many Kiwis who knew Rob Hall, the Adventure Consulting crew or are part of the mountaineering community, the movie will cast up painful memories. But it also provides some powerful lessons in what can go wrong in decision making in what management experts refer to as “temporary organisations”. 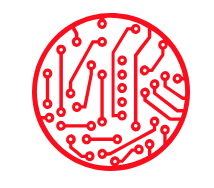 It may be a military platoon, a team working on an IT project or, as in this case, a group of mountaineers. When small groups come together to achieve an objective, what are the things that contribute to determining how successful they will be? 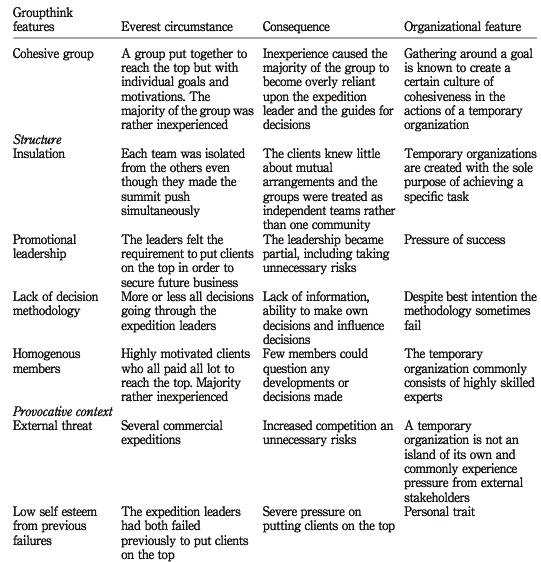 Back in 2008, Markus Hällgren, an expert in organization theory at the Umea University in Sweden, focussed on the 1996 Everest tragedy in his paper “Groupthink in temporary organisations” which was published in the International Journal of Managing Projects in Business. Hällgren argues that the Everest tragedy was a classic example of groupthink. On Everest in 1996, nothing was done to attend to the unrecognized problem of groupthink which ultimately killed several people. The fact that such deaths are still happening and projects still fail shows that the causes such as the possibility of groupthink in a temporary organization deserve further investigation. Projects do not always kill people but to an organization a failed project can be fatal. Ultimately what killed the mountaineers on Everest was that they didn’t stick to the agreed 2pm turnaround time, leaving themselves too little time to get back down the mountain before they started to lose the light and bad weather closed in. The miscommunication of this crucial element and the failure of the leadership to ensure that the turn-around deadline was met set in train a series of events that resulted in the loss of life. This was all compounded by the fact that there were too many people attempting to summit at the same time and the various expedition groups hadn’t thought through how to manage the load on the mountain. The context is also important – Hall was under pressure to get clients to the summit after failing to do so in previous seasons. There’s a point in the movie where Hall, on his way down from the summit with a couple of clients, encounters Doug Hansen, who had unsuccessfully tried the previous year to reach the summit. Suffering altitude sickness, Hansen was clearly in bad shape, but manages to convince Hall to take him to the top. Had Hall made a different decision, he and Hanson may still be alive. There were obvious flaws in the decision methodology present at Everest, including all decisions being bureaucratized and centralized without the possibility of communicating them due to lack of communication devices and group features. The purpose of the communication arrangements was clear – it was to ensure decisions were made by the professionals by avoiding any discussion with inexperienced climbers. In theory, this arrangement may seem reasonable and useful. In practice, the lack of communication devices and more general mind guarding and censorship of information made the centralized decision making a potential death trap. And so, it proved, as the risk was triggered. Similarly, in project management, the decision methodology may seem proper and sound but in practice may prove to be hazardous. In total, 12 people died on Everest in the season of 1996, a record number of deaths until this year, when devastating avalanches caused by the Nepal earthquake killed 18 people. Bodies now litter Everest. I can’t relate to people’s desire to attempt the summit of Everest. I’d personally like to see the mountain off-limits to climbing, at least for a period.